This year’s Willy Wonka family costume theme has been my favorite family themed costume we have ever done. I loved making each of the costumes! Today, I am sharing the main man himself, Willy Wonka! Only there is a slight twist. 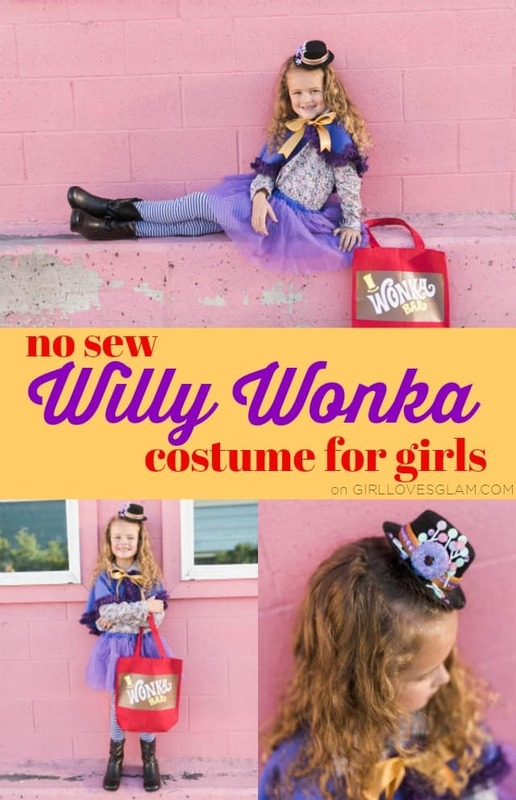 It is a Willy Wonka costume for girls! If you missed the Wonka Bar costume and the Golden Ticket costume, check those out too! There is nothing that screams Willy Wonka more than a classic Wonka Bar! That is why I was excited to be a Wonka Bar in our Willy Wonka family Halloween costume theme. Yesterday, I shared the Wonka Golden Ticket costume. 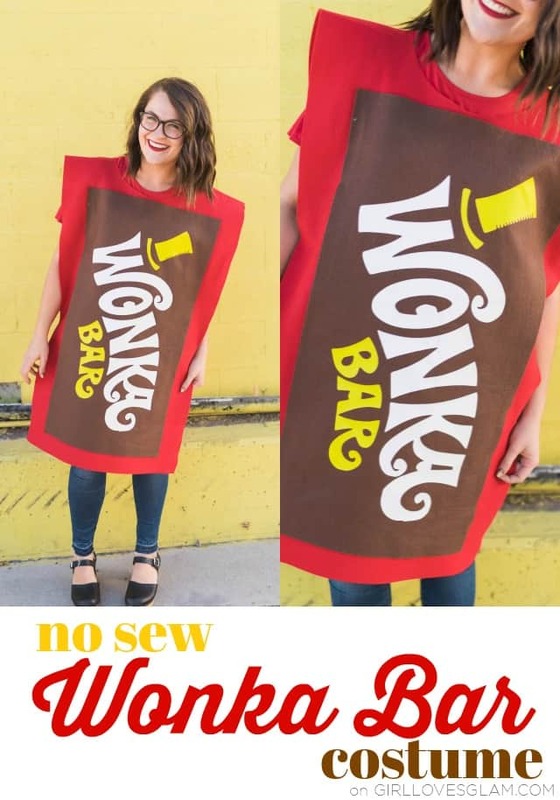 Today is all about the no sew Wonka Bar costume! Willy Wonka is a family favorite at our house. We love the book, Charlie and the Chocolate Factory and the movies. 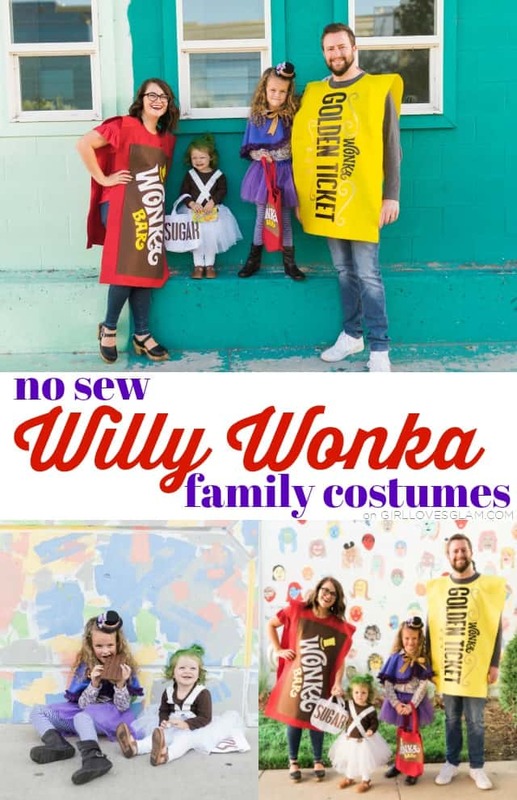 That’s why we knew we needed our family Halloween costume to be a Willy Wonka family costume. The Golden Ticket is such an important part of the story that we had to have that as one the costumes. 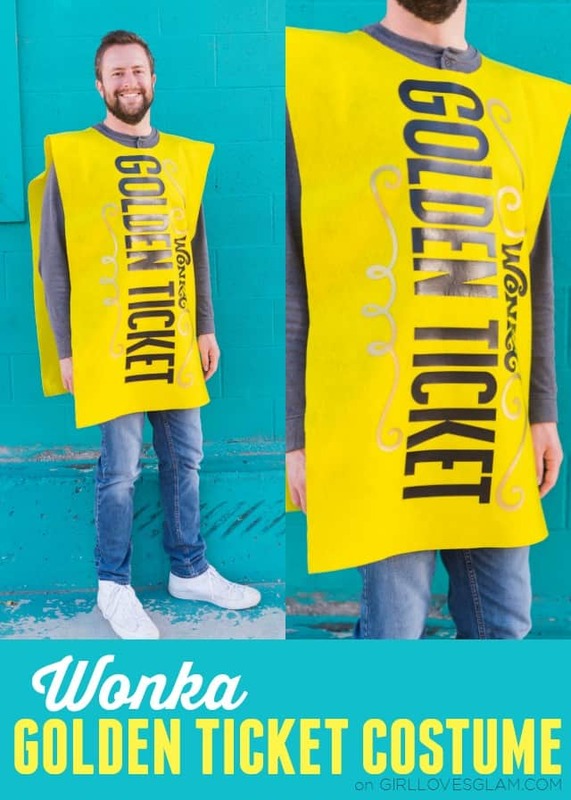 So to kick off the no sew Halloween costumes for 2018, here is the Golden Ticket costume! 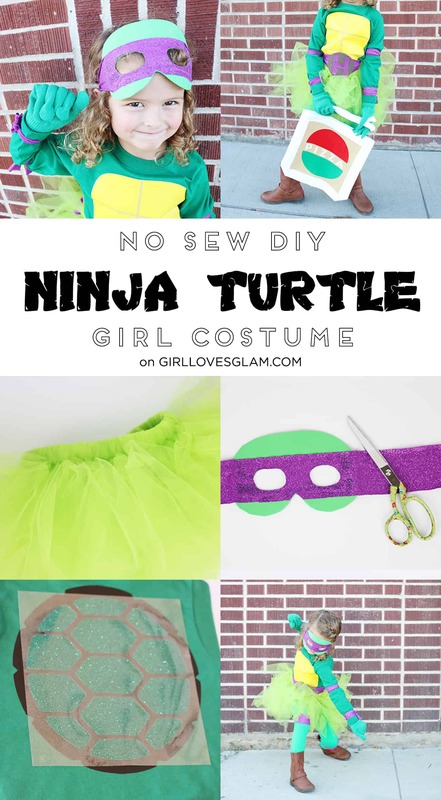 DIY No Sew Ninja Turtle Costume for Girls! It is officially the time of year that I look forward to each and every year. When I first started making my family costumes, I didn’t mean to create the no sew theme that I did. But I am sure glad that I didn’t start out by sewing every costume because that would have never lasted! If you are new around these parts, this is the 5th year that I have created a new sew costume for my daughter. We end up having a family theme with all of us, but I usually just share the tutorial for her costume. I will be sharing our entire family look later, but today I am excited to show you my very own little Ninja Turtle! 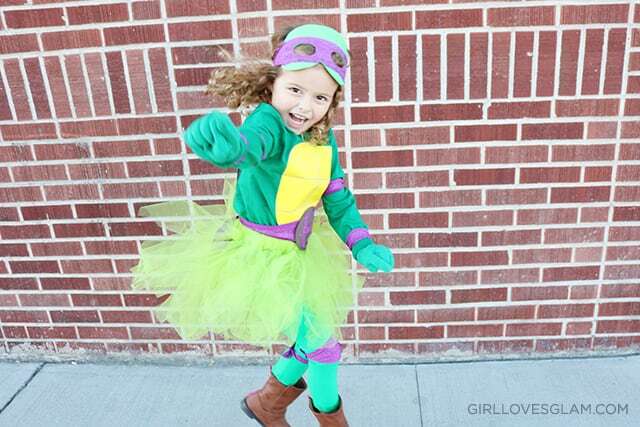 Here is my DIY No Sew Ninja Turtle Costume for Girls! This costume was not only easy to make, but it was so fun too! The best part was definitely putting it on my daughter and seeing her instantly turn into a ninja. Its like she literally thought she was a Ninja Turtle! Choosing our family Halloween costume each year is quite the debate. The last two years haven’t been too bad, but this year it was much more difficult because 3 1/2 year olds seem to change their minds every 5 minutes! Eventually, we narrowed it down to being Minions, Wreck it Ralph characters, or Powerpuff Girls characters. It took a long time to decide, but we finally decided on Wreck it Ralph characters! I kind of love that we are going with this theme for a few reasons… 1. I love this movie and I don’t think it got the love that it deserves. 2. This movie is a few years old and there aren’t going to be a million other people dressed like us. 3. This Vanellope Von Schweetz costume is out. of. CONTROL! 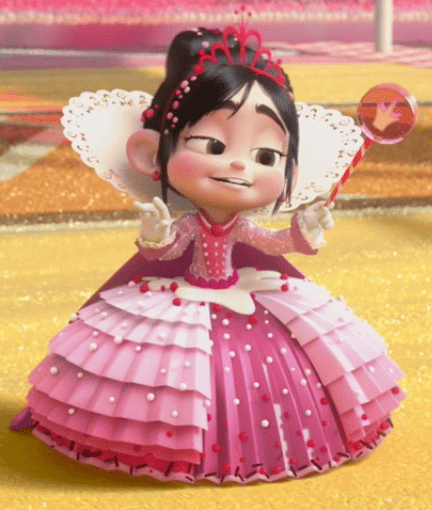 After we decided what we were going to be, I asked my daughter about the Vanellope Von Schweetz costume and that is when I realized that she wasn’t thinking about the hoodie that Vanellope wears 99% of the time in the movie, she was thinking of the Vanellope Von Schweetz princess dress that she wears for about 30 seconds in the entire movie! So, I mapped it all out and made it happen. 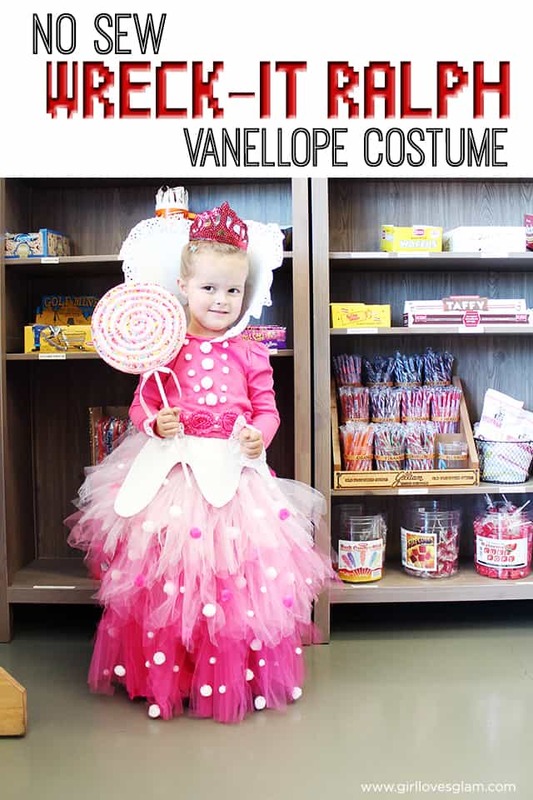 Introducing the Vanellope Von Schweetz Princess Costume! I am excited to be a part of the Really Awesome Handmade Costume Series with C.R.A.F.T. this year! 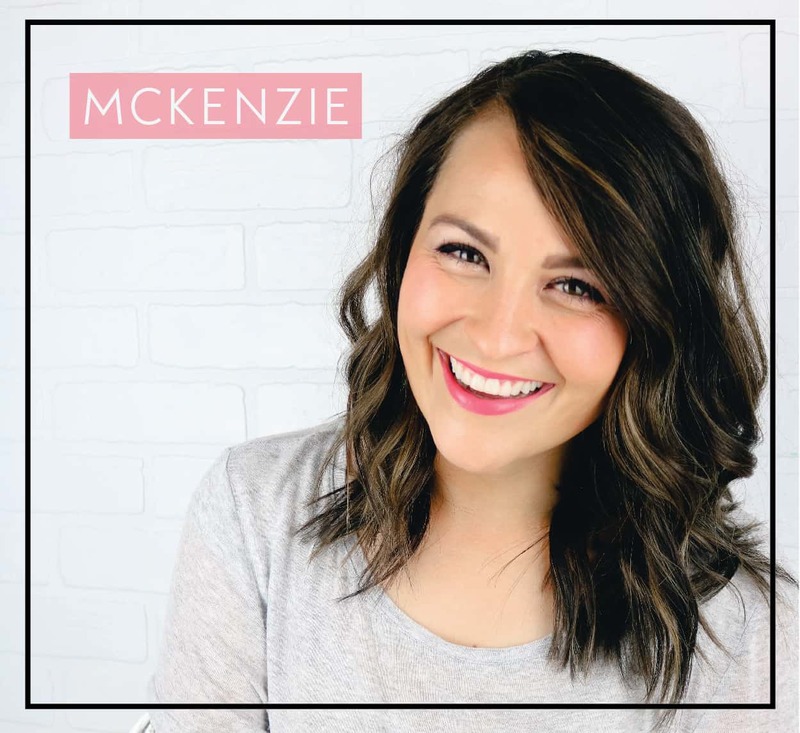 Did you know that she has another website called Really Awesome Costumes that is full of the coolest costumes you’ve ever seen? She does! 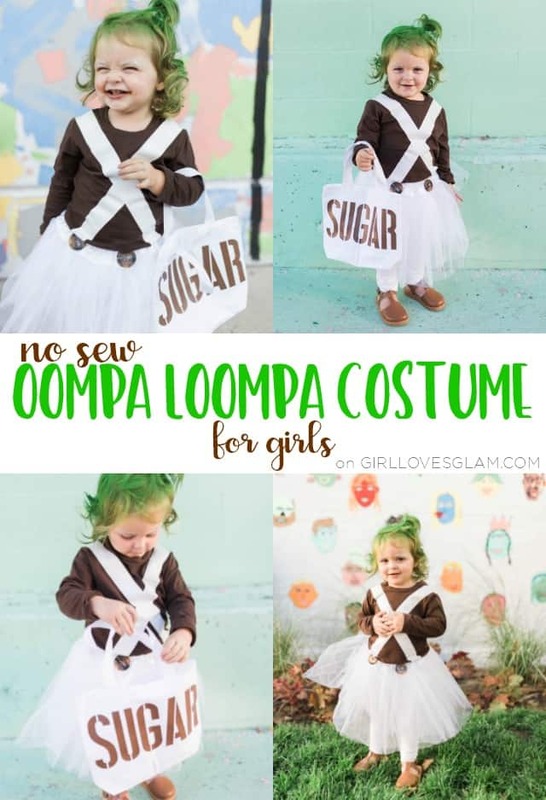 If you need to find a great DIY costume for yourself, your kids, your husband, etc. that is the place to look! The costume I am about to share will be featured on there tomorrow! Well, here is the moment we have all been waiting for. Little girl’s costume for the year…. Elmo! 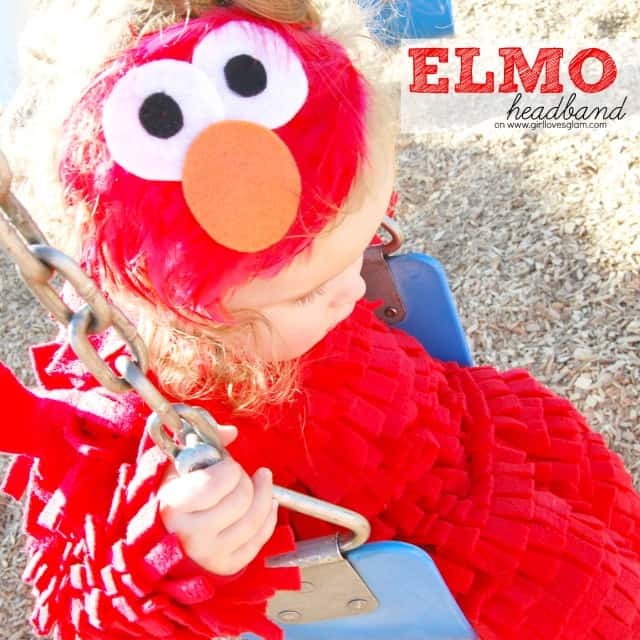 Or as she would say it… “Melmo!” A few victories with this costume include… The fact that she recognizes it as Elmo. 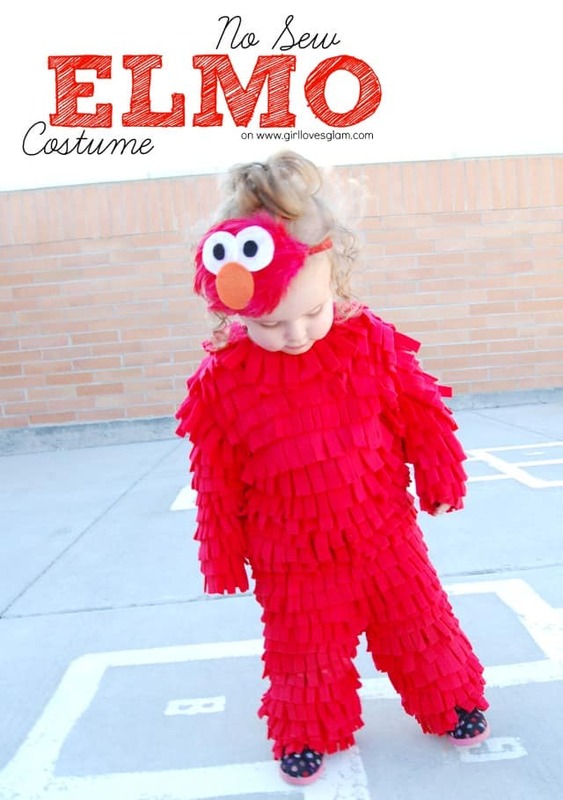 It costed less to make than the store bought Elmo costumes. 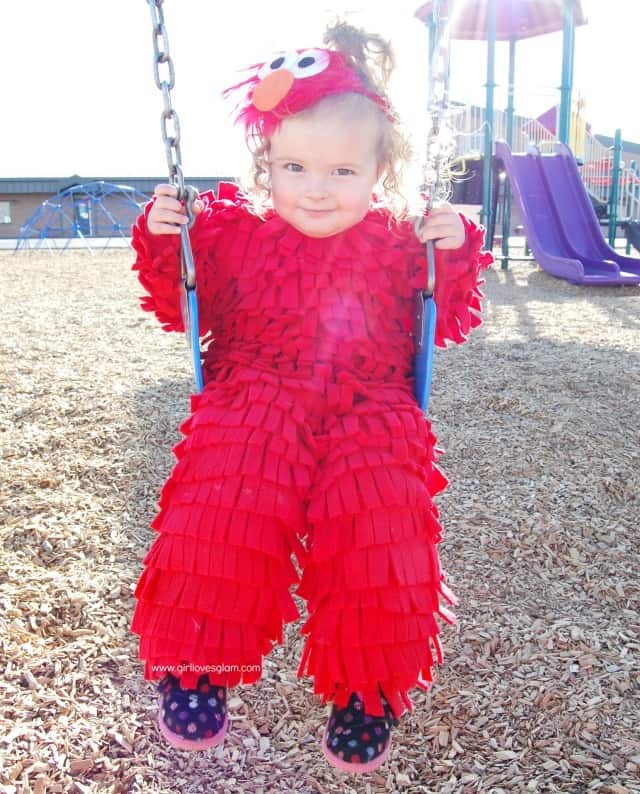 It is 1000000000% cuter than the store bought Elmo costumes. It was will keep her warm during the freezing Idaho Halloween. It was totally no sew! First, the fleece into strips about 2-3 inches wide. 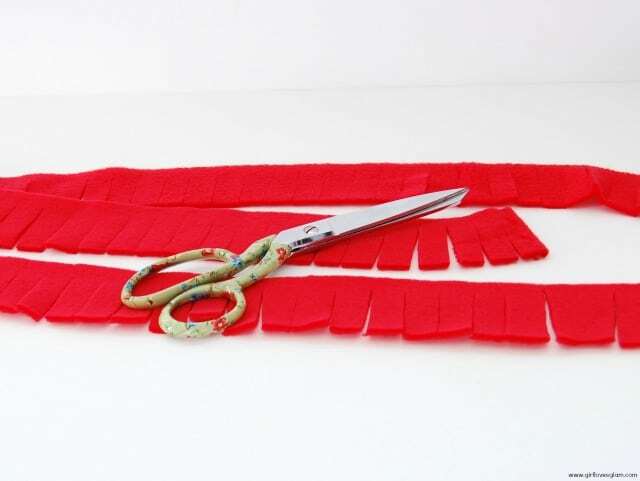 Cut those strips into fringes. I folded the strips over a few times so I didn’t have to cut so many fringes. 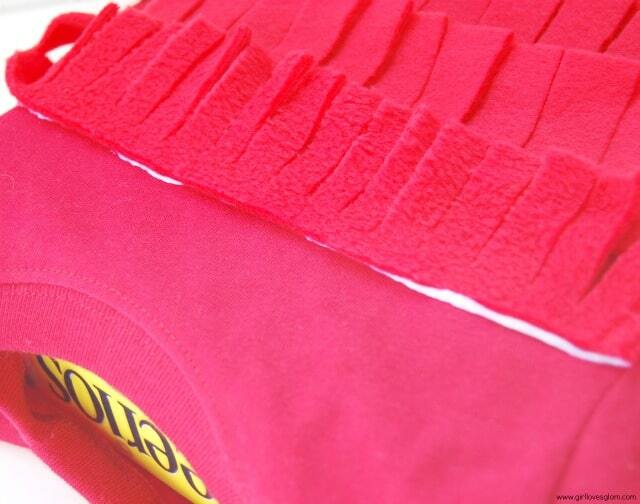 Lay out the shirt and pants and glue the fringe onto it. Overlap the fringe just a little bit as you work your way up. Make sure to cover every part of the clothing with fringe. I put a cereal box in the shirt so that the glue wouldn’t go through the shirt onto the other side. Let the glue dry for 24 hours. Find round objects in your house that you can trace to make the perfect sizes for the eyes and nose. 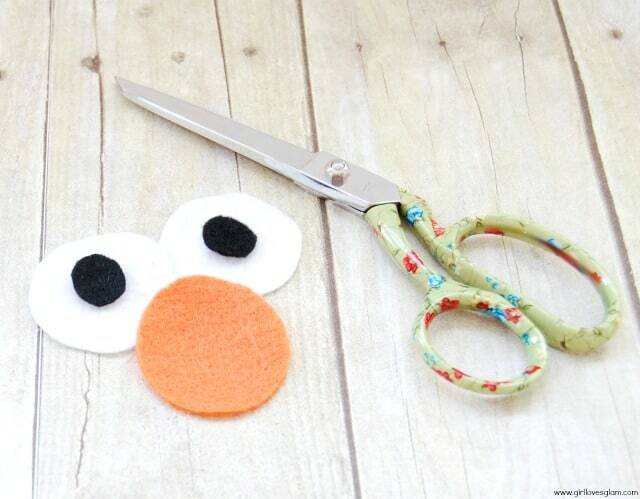 Trace them onto the felt and cut them out. The nose is a little more oval, but you can cut the circle and just cut a little bit off the sides to make it more of an oval shape. 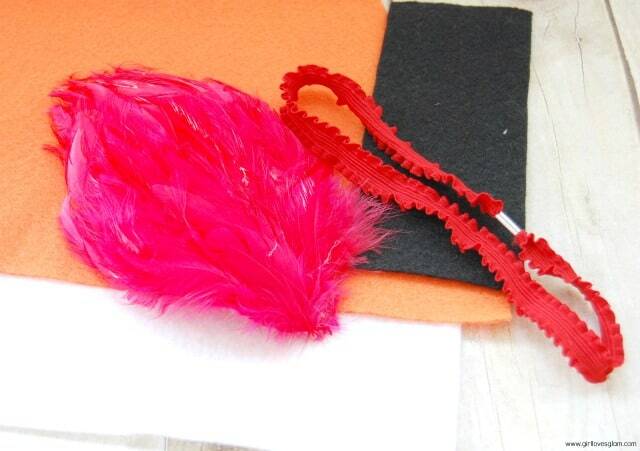 Take all of the shapes and glue them onto the hackle pad. 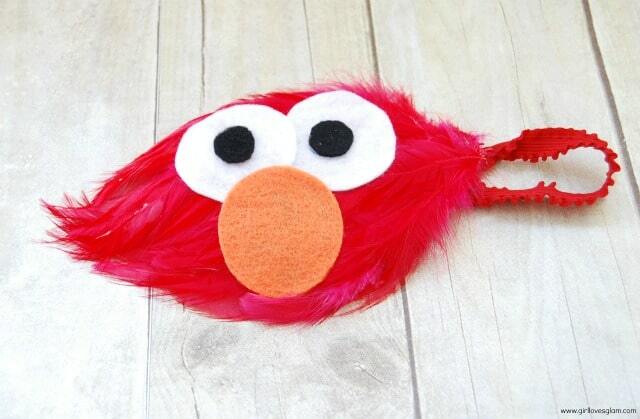 Glue the hackle pad onto the headband and let it dry. Once you finish that, you are done! 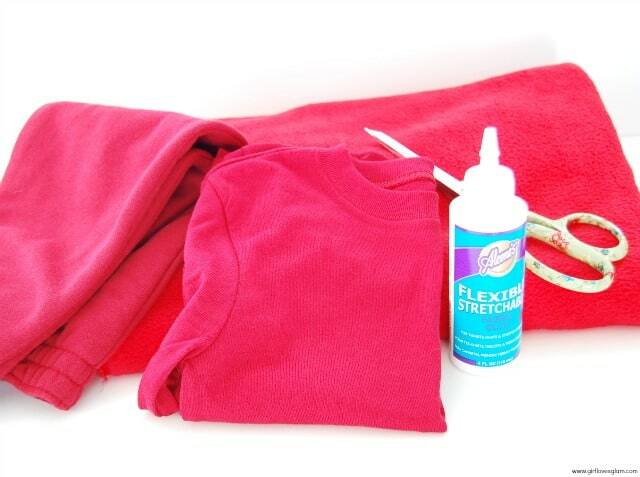 Your little munchkin can now dress up as that lovable red, furry monster! 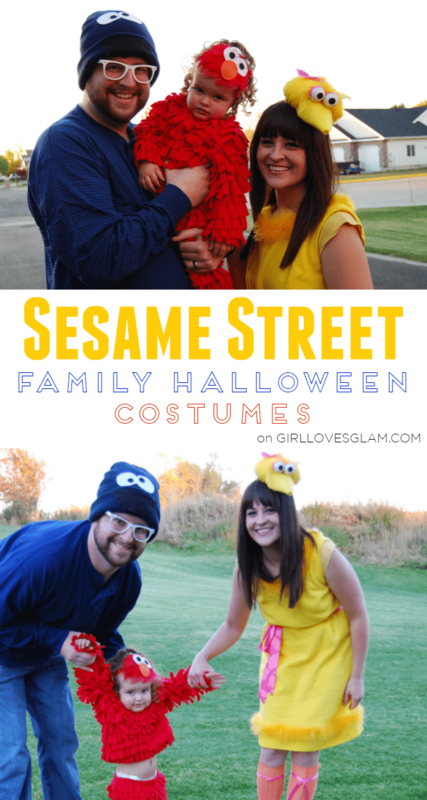 We dressed as Sesame Street characters as a family with our little Elmo! For Cookie Monster, we just purchased a blue shirt and blue beanie. I cut out felt eyes and a glued them to the hat. For my Big Bird costume, we actually borrowed it from an incredibly talented neighbor! The costume would be insanely simple to recreate though. The dress was made of yellow fleece and was literally just a straight seam up the side and yellow boas glued to the collar and along the bottom. The socks were dyed orange because she couldn’t find any orange knee socks when she made the costume. To make the headband, she stuffed a circular piece of fleece for the head. She took a cereal box, cut it apart, and rolled it into the shape of a beak and then glued yellow fabric over it. She glued it onto the head. The eyeballs were tennis balls with black felt glued to them. She glued it all onto a headband and added some feathers to the top of it for detail. It was so sweet of her to let me borrow it! 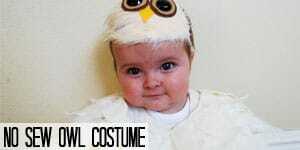 If you happened to miss out on her handmade Hedwig the owl costume from last year, check it out too! I used a lot of the same concepts on both costumes! Super easy!